I have really enjoyed working with Glen this past year. He has helped me a lot. He is very knowledgeable and passionate about shooting. 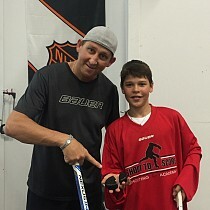 From my quick release and my one timers, he has helped me to stay sharp. He is able to work within each player's individualized style . . . And believe me, Glen can ALWAYS find something to work on! Thanks to Glen Tucker, I've not only improved the quickness and accuracy of my shot, but also my confidence to use it more often. Glen does a tremendous job of putting you in uncomfortable positions to practice realistic, game-like situations. I've never felt more prepared for the season than I have after spending time this summer at STS. There's no one more dedicated to their work and no one who loves what they do as much as Glen does. It's a blast working with him and his staff as they provide a really fun and welcoming environment! 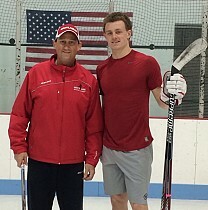 I highly recommend STS for hockey players of all ages who are looking to improve their shot the proper way. Tucks is the real deal. Shoot to Score provides intensive training like nothing else out there. 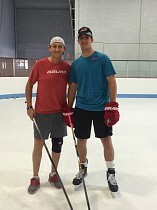 It’s not just about shooting (which is a major part of the game), but the puck handling skills that Glen provides are broken down easily so that you can understand and correct your technique. I really like that what STS does in class can be taken to the game and makes an immediate difference. He always said that all of those shooting classes would pay off!!! The principles of hockey are quite simple: skate, pass, and shoot. However, the one aspect that is greatly overlooked is the importance of practicing shooting. Through repetition of the techniques taught by Glen Tucker, I have seen an increase in the velocity and accuracy of my shot. Not only do I feel more confident in these areas, but also in my ability to release the puck quickly in minimal time, space, and effort. 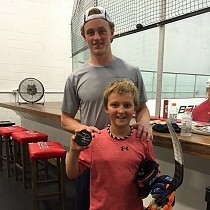 It is for these reasons I would recommend Shoot to Score Hockey School to players of all ages. Having confidence with the puck is your key to success in hockey. 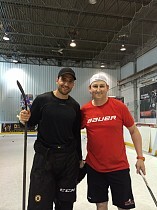 My work in the past with Glen allowed me to develop my skills to the level that brought me to the NHL. The instruction level provided is energetic and of professional caliber. Sometimes you have to go back to basics to improve overall, whether you are just entering houseleague, or tuning up as a professional. Skating, passing, shooting, and puck handling . . . There is the game right there, and Shoot to Score will teach it all! 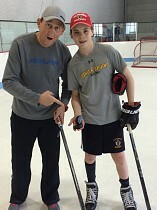 "Glen Tucker and Shoot to Score Hockey School will improve your game." 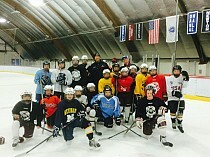 Ask any hockey coach what they would like to have more of in their line-up and they would probably answer scoring. Goal scorers are hot commodities at all levels of the game and proven ones are hard to find. In an age where goaltending is improving and defensive team play is coached and learned so well, it is getting harder and harder to score. These trends require that we, as players and coaches, begin to find ways to put more offense in our game. One of the simplest ways to do this, as a player, is to improve the fundamental skill of shooting. Ask any pro hockey player what the most critical detail is in goal scoring and he will most certainly answer quickness of release. This is where Glen Tucker and Shoot to Score Hockey School will improve your game. Glen breaks down the shooting skill like nobody else in the game. His system is innovative and results-oriented. He trains your brain and body to be quick and powerful through your stick. The traditional way of shooting which we all learned is slower and works primarily on one plane through weight transfer. Glen teaches you to shoot from many different positions with your arms and body being independent yet synergistic. This results in a quick, hard shot time after time. And ultimately it will result in more goals for you when you get into a game. The best part is that all of this is done in a 1-on-1 teaching environment. It is you and him. You have your own personal shooting coach 100% of the time! The drills he does are individualized for you as a shooter, and they are easy to duplicate at home, so the only thing that can hold you back is YOU. I highly recommend Shoot to Score. And I guarantee that you will see measurable results almost immediately. If you want to make one impactful improvement in your game, this is definitely the one you want!! 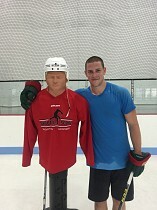 This past summer was my first as a professional hockey player, and Glen was a huge part of making it a successful one. 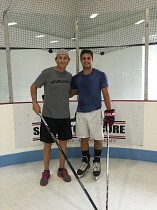 Combining Glen's expertise with a workout, diet, and training regimen really made me the best hockey player I could be when camp started in September. Glen's the only one who teaches his technique, and it works. Two, hour-long sessions a week improved the quickness and power of my wrist and slap shots more than I thought possible, and I felt it each time I went on the ice after a session. Can't thank Glen enough for the work he put in with me this summer, and I look forward to continuing to work with him in the future! Thanks, Glen!! The thing that impressed me the most while working with Glen at Shoot to Score was how invested he was in making me better. No matter what time of day or night it was, he was always willing to stay as long as I wanted to work on different aspects of my shot. Growing up I was always taught to “grip it and rip it” when I was working on my shot. After a couple lessons I could notice a huge difference in how quickly I could get my shot off and how much harder it was too. Thank you, Glen, for bringing my shot the next level!